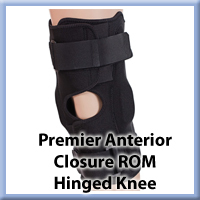 The Premier Anterior Closure ROM Hinged Knee Brace allows for full flexion and extension control in a wrap-around design for ease of application. 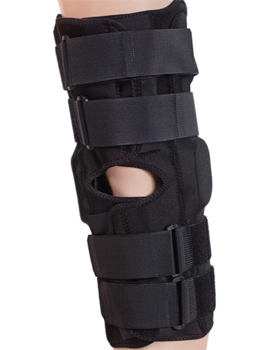 It is available in two lengths: 13" and 16". 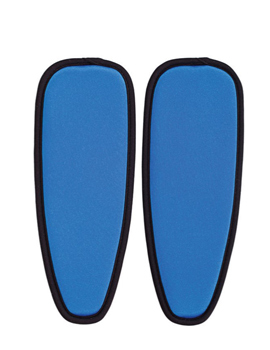 POS-KN4010 POS-KN4011 XSmall 15" to 16" 11" to 13" 10" to 11"
POS-KN4020 POS-KN4021 Small 16" to 17" 12" to 14" 11" to 12"
POS-KN4030 POS-KN4031 Medium 18" to 19" 14" to 16" 13" to 14"
POS-KN4040 POS-KN4041 Large 19" to 21" 16" to 18" 15" to 16"
POS-KN4050 POS-KN4051 XLarge 21" to 23" 18" to 20" 17" to 18"
POS-KN4060 POS-KN4061 2XLarge 23" to 25" 20" to 22" 19" to 20"
The Premier Hinged Knee Brace features a wrap-around design enabling the clinician and patient to apply the device more easily. 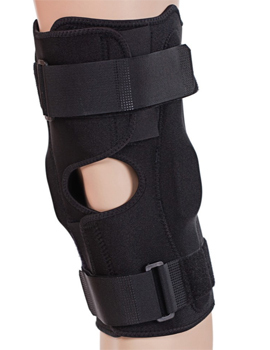 It has an elasticized top strap for a better fit as well as heavy-duty hinges for both medial and lateral support. 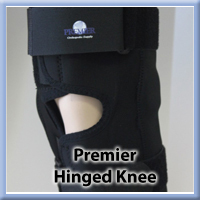 However, it is lightweight and the material is breathable for patient comfort. POS-3801 XSmall 15" to 16" 11" to 13" 10" to 11"
POS-3802 Small 16" to 17" 12" to 14" 11" to 12"
POS-3803 Medium 18" to 19" 14" to 16" 13" to 14"
POS-3804 Large 19" to 21" 16" to 18" 15" to 16"
POS-3805 XLarge 21" to 23" 18" to 20" 17" to 18"
POS-3806 2XLarge 23" to 25" 20" to 22" 19" to 20"
The Premier Post-Op Knee with ROM was designed so that the application of the brace is simple for both the clincian and patient. 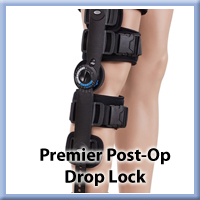 The low profile hinge can be set and locks quickly in 0, 10, 20, 30, 45, 60, 75, & 90 degree increments. 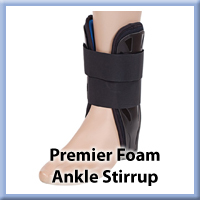 The Full Foam version provide the optimum compression and control of soft tissues. 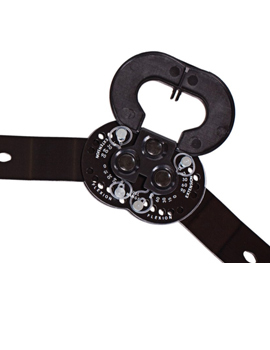 The breakaway struts makes for a simple, tool-free length adjustment. 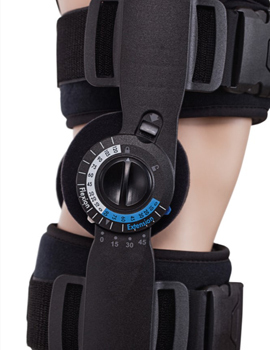 The Premier Post-Op Knee is a simple brace with easy to use hinge settings, including a drop-lock button that adjusts at 0, 15, 30, 45 degrees. 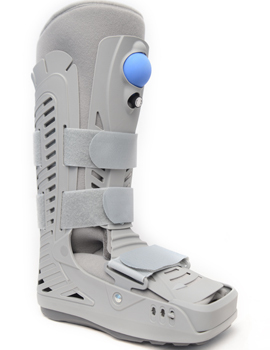 The struts can also be adjusted in length from 17" to 28" with just the push of a button. 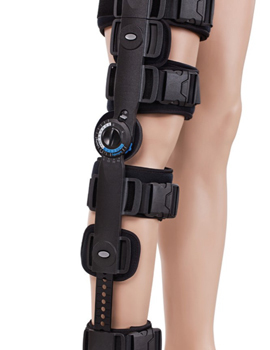 The quick release buckles make the brace easy to put on and take off. 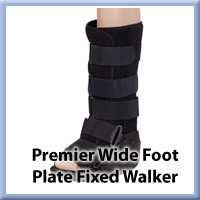 POS-8200 Cool Wrap Regular Up to 28"
The Premier Wide Foot Plate Walker offers both patient comfort and stability. 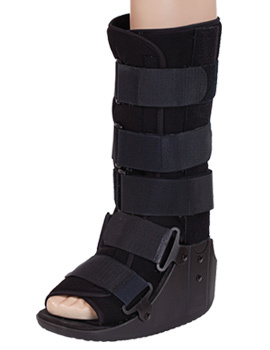 The rocker bottom is low and wide to help promote a more natural gait. 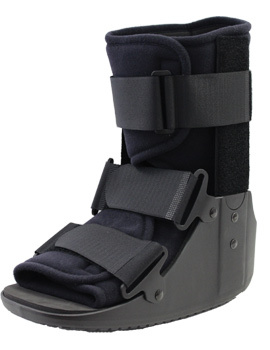 It is offered in a tall and short version. 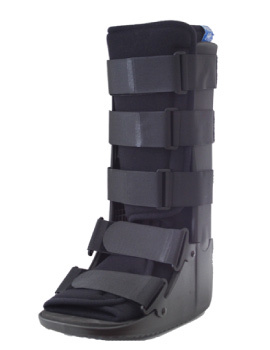 Also available; Metal Upright designed and constructed with malleable aluminum uprights. 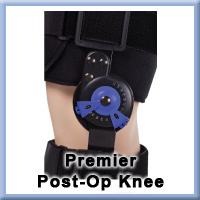 Plastic Upright designed and constructed with durable plastic uprights. 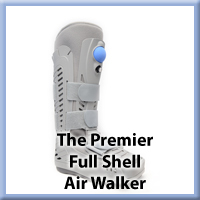 The Premier Wide Foot Plate Air Walker is designed with a built-in bladder pump which helps control compression levels, increase stabilization and reduce edema. 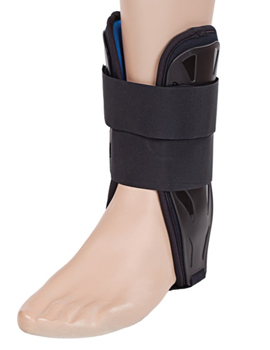 The wide foot plate makes it ideal for patients who may have moderate to severe ankle strains, stable foot and/or ankle fractures; or it is often applied post ORIF and cast removal. 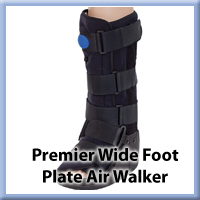 The non-skid rocker sole helps promote proper gait. It is offered in a tall and short version. 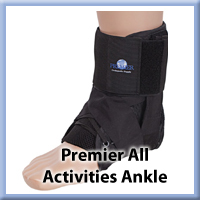 The Premier All Activities Ankle brace has a lace-up design for a secure fit and is constructed of nylon for long lasting wear. 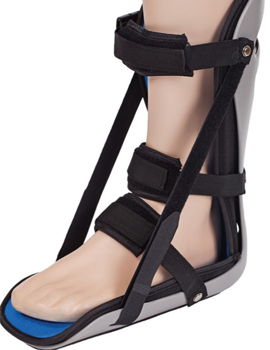 The figure-8 strapping system and universal stabilization straps allow the ankle to be positioned into inversion and eversion so that maximum stability is achieved. 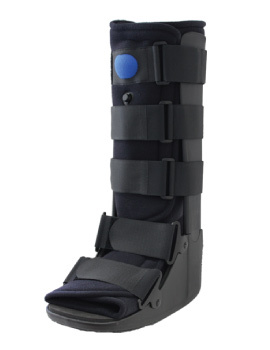 The removable medial and lateral plastic insert stays provides support. 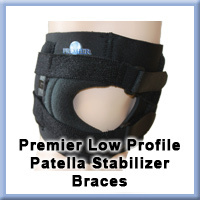 The low profile design allows the brace to be worn in an athletic shoe. POS-0901 XSmall 10" to 11"
POS-0902 Small 11" to 12"
POS-0903 Medium 12" to 13"
POS-0904 Large 13" to 14"
POS-0905 XLarge 14" to 15"
The dorsiflexion design of the Premier Night Splint applies a stretch from 10 degrees to 90 degrees so that the patient can obtain effective pain relief. 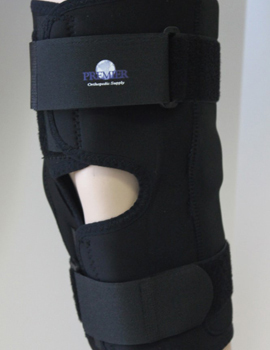 The splint was designed both lightweight and low profile so that the patient is comfortable wearing the splint. 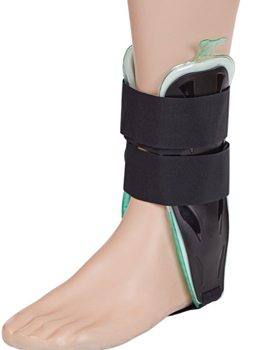 There are two adjustable straps that will allow the patient to control the amount of dorsiflexion. 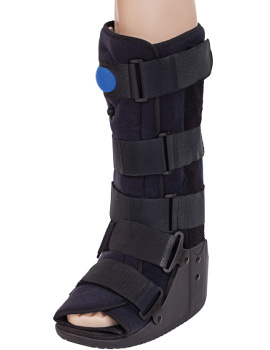 Wedges are also provided to allow the patient additional stretching. 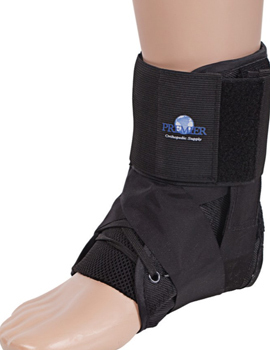 The Premier Foam Ankle Brace was developed with a lightweight foam and low profile design to provide patients an optimum cushioned environment. 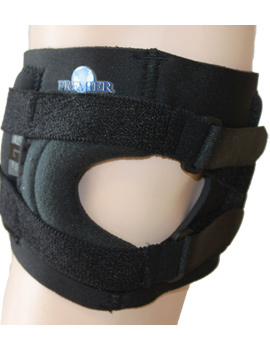 The result is a brace that's easy to apply and is comfortable. 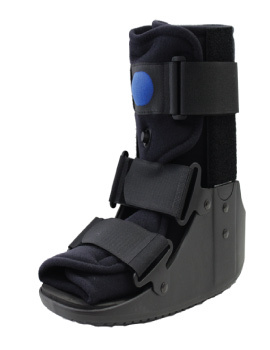 The rigid medial and lateral shells minimize ankle rotation and inversion/eversion. 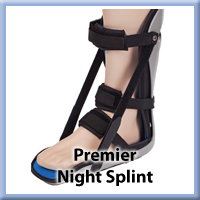 The heel strap is adjustable and the low profile design allows for the stirrup to fit easily in a shoe. 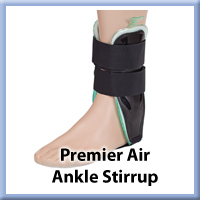 The Premier Air Ankle Stirrup has inflatable air bladders to provide patient with adjustable pneumatic compression. 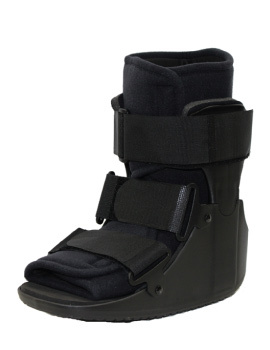 The brace was designed with rigid medial and lateral shells to minimize ankle rotation and inversion/eversion. 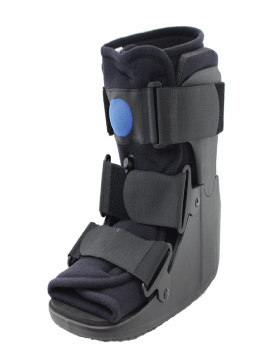 The heel strap is adjustable and the low profile design allows the strirrup to fit easily in a shoe. 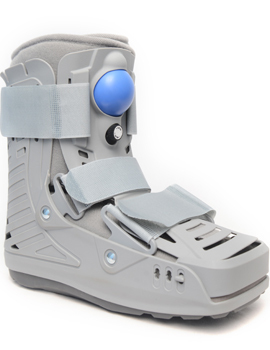 Rocker bottom mimics natural gait. 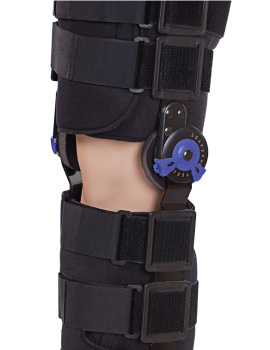 Features a textured buttress for optimum patella control, strapping system to provide a dynamic treatment and lateral/medial hinges for support. POS-4601 XSmall 12" - 13"
POS-4602 Small 13" - 14"
POS-4603 Medium 14" - 15"
POS-4604 Large 15" - 16"
POS-4605 XLarge 16" - 18"
POS-4606 2XLarge 18" - 20"